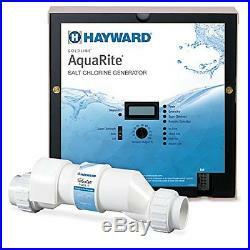 Hayward aq-trol-rj aquatrol salt chlorination system for above-ground pools new. At hayward, we’re more than just equipment. Our objective is to make your pool experience worry and hassle-free. That’s why our equipment is engineered to last and work smart at keeping your pool sparkling clean and trouble free. For over 80-years, we’ve been helping pool owners enjoy the pleasures of pool ownership by manufacturing cutting edge, technologically advanced pool equipment worldwide. We strive to ensure that your totally hayward system operates at maximum efficiency all season long. Our goal is that at the end of the day, your only concern is to turn your equipment on and off. Whether you are trying to create the perfect backyard environment, reduce operating and maintenance costs through the ease of wireless controls, hayward is your single source solution. Our products include a complete line of technologically advanced pumps, filters, heaters, heat pumps, automatic pool cleaners, lighting, controls and salt chlorine generators high-quality components engineered to work together to keep your pool at its best. Goldline aq-trol-rj, aqua trol above-ground chlorinator return jet fitting, straight blade, line cord and outlet. The aqua trol electronic chlorine generator (also known as a salt chlorinator) is designed specifically for above-ground pools up to 18,000-gallon. The aqua trol has all the same functions and features of the aqua rite but with a lower chlorine output. 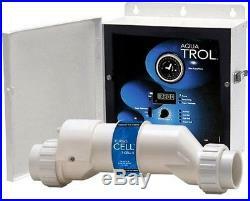 The aqua trol also has an integral time clock for control of the pool filtration pump. Since many above-ground pools already have a single electrical outlet for the filter pump, the aqua trol is designed with an outlet timer controlled led. For the filter pump to plug into, the aqua trol then plugs into the original outlet the filter pump was using. The savings on chlorine and electrical power alone (if the pump was previously running 24 hours), will have the aqua trol paying for itself in just a few short years. The aqua trol system typically installs in less than 30 minutes and is very easy to operate. This model is equipped with a return jet fitting, featuring a “straight blade” line cord and outlet. Quick and easy 30-minute installation. Rj models mount the cell directly to the return jet (on the outside of the pool). 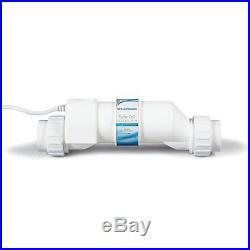 Comes with an integral time clock for control of the pool filtration pump. The best water quality – soft silky feel – no more red eyes or dry skin; always crystal clear and ready for swimming. Digital salt display and 7 diagnostic indicators. Selectable super chlorinate function. Check out my other items. Be sure to add me to your favourites list. The free listing tool. The item “Hayward AQ-TROL-RJ AquaTrol Salt Chlorination System for Above-Ground Pools New” is in sale since Friday, November 25, 2016. This item is in the category “Home & Garden\Yard, Garden & Outdoor Living\Pools & Spas\Pool Equipment & Parts\Other Pool Equipment & Parts”. The seller is “sarafankit2009″ and is located in Olean, New York. This item can be shipped to United States. 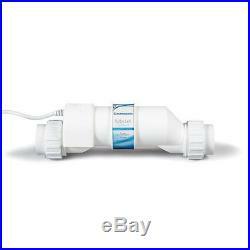 Hayward GLX-CELL-15-W TurboCell Salt Chlorination Cell for In-Ground Pools NEW. Replacement Salt Cell for in-ground pools up to 40,000 gallons. Works with Hayward Goldline AquaRite, AquaRite Pro, SwimPure Plus and SwimPure Plus with Controls , Hayward AquaPlus, ProLogic and OmniLogic automation systems. Also interfaces with Pentair and Polaris pool automation controls. UL-listed and independently certified by the National Sanitation Foundation (NSF); independently certified for safe use with Hayward salt chlorinators and automation systems. Superior value and longer life than low-cost generic cells. Digital display of salt level and 8 LED status indicators. The item “Hayward GLX-CELL-15-W TurboCell Salt Chlorination Cell for In-Ground Pools NEW” is in sale since Friday, February 12, 2016. This item is in the category “Home & Garden\Yard, Garden & Outdoor Living\Pools & Spas\Pool Equipment & Parts\Other Pool Equipment & Parts”. The seller is “recovermypc” and is located in Niagara Falls, New York. This item can be shipped to United States, to all countries in Europe, to all countries in continental Asia, to Canada, to Australia. IMPORTANT NOTE : ALL T-CELLS INSTALLED PRIOR TO 2010 MUST BE REPLACED WITH THE SAME T-CELL NUMBER. No more mixing, measuring and messing around with liquid or tablet chlorine. Aqua Rite automatically turns common salt into a self-regenerating supply of pure chlorine. For pool and spa water that’s clean, clear and luxuriously soft. The key to Aqua Rite’s chlorine generation is the Turbo Cell®, a specially-designed converter connected to the control unit by a simple plug-in cord, and plumbed into the filter pump’s return line to the pool. As water is pushed through the Turbo Cell, an extremely safe low-voltage electrical charge turns the salt previously added to the water into fresh, sanitizing chlorine which is then dispersed evenly throughout the pool via the return jets. Simple homeowner operation Adjust chlorine output from 1100%. The best water quality attainable Always crystal clear and ready for swimming Soft silky feelno more red eyes or dry skin. Microprocessor automates all functions. Digital salt display and 8 diagnostic indicators. Patented Turbo Cell for maximum efficiency and flow rates. Automatically cleans the cell by periodically reversing polarity. Quick, weatherproof connections inside control door. Single unit for 120VAC/240VAC 50/60 Hz power input. UL and CUL Listed, NSF certified. USA Pool Super Store is a proudly American owned and operated and located right here in USA. Have peace of mind when shopping with USA Pool Super Store – we hold ourselves to the highest standards possible when it comes to internet security and privacy protection. USA Pool Super Store pledges not to share any of your personal or financial details with other organizations for commercial purposes, and we do not rent and/or sell our customer list and/or customer data. The item “Hayward Goldline T-CELL-9 Turbo Cell, 25,000 Gallon Pool Salt Chlorination” is in sale since Monday, November 07, 2016. This item is in the category “Home & Garden\Yard, Garden & Outdoor Living\Pools & Spas\Pool Equipment & Parts\Other Pool Equipment & Parts”. The seller is “usapoolsuperstore” and is located in Buffalo, New York. This item can be shipped to United States. IMPORTANT NOTE : ALL T-CELLS INSTALLED PRIOR TO 2010 MUST BE REPLACED WITH THE SAME T-CELL NUMBER. No more mixing, measuring and messing around with liquid or tablet chlorine. Aqua Rite automatically turns common salt into a self-regenerating supply of pure chlorine. For pool and spa water that’s clean, clear and luxuriously soft. The key to Aqua Rite’s chlorine generation is the Turbo Cell®, a specially-designed converter connected to the control unit by a simple plug-in cord, and plumbed into the filter pump’s return line to the pool. As water is pushed through the Turbo Cell, an extremely safe low-voltage electrical charge turns the salt previously added to the water into fresh, sanitizing chlorine which is then dispersed evenly throughout the pool via the return jets. Simple homeowner operation Adjust chlorine output from 1100%. The best water quality attainable Always crystal clear and ready for swimming Soft silky feelno more red eyes or dry skin. Microprocessor automates all functions. Digital salt display and 8 diagnostic indicators. Patented Turbo Cell for maximum efficiency and flow rates. Automatically cleans the cell by periodically reversing polarity. Quick, weatherproof connections inside control door. Single unit for 120VAC/240VAC 50/60 Hz power input. UL and CUL Listed, NSF certified. USA Pool Super Store is a proudly American owned and operated and located right here in USA. Have peace of mind when shopping with USA Pool Super Store – we hold ourselves to the highest standards possible when it comes to internet security and privacy protection. USA Pool Super Store pledges not to share any of your personal or financial details with other organizations for commercial purposes, and we do not rent and/or sell our customer list and/or customer data. The item “Hayward Goldline T-CELL-3 Turbo Cell, 15,000 Gallon Pool Salt Chlorination” is in sale since Monday, November 07, 2016. This item is in the category “Home & Garden\Yard, Garden & Outdoor Living\Pools & Spas\Pool Equipment & Parts\Other Pool Equipment & Parts”. The seller is “usapoolsuperstore” and is located in Buffalo, New York. This item can be shipped to United States.